On the second shelf, fifth from the left, sits a reddish box labeled “Missale * Lewis E 160,” one of hundreds of volumes locked behind glass doors in a rare manuscripts room at the Free Library of Philadelphia. “This is it,” says Allison Freyermuth, head of the Rare Book Department. Pulling it carefully from the bookcase and placing it on a red velvet-covered table, she opens the box. Inside is a leather-bound book, a bit worn on the edges. Not surprising, since it is 500 years old. An illuminated manuscript of gospels, dated 1525, written in Latin, two hand-lettered columns fill each parchment page, save those with hand-painted scenes in jewel tones and flashes of gold. “It’s actually quite beautiful, this one,” she says. The medieval manuscript is one of seven that will be packed in custom-made boxes on this July day, preparing them for a trip to the University of Pennsylvania. There, each will go through a complex digitization process at Penn Libraries, allowing the world to see what has for centuries been visible to relatively few. “If medieval manuscripts—which are historical documents, marks of lives well spent, and also consummate works of art—are going to reach their full potential in the 21st century, then they have to reach new audiences,” says William Noel, director of Penn Libraries Kislak Center for Special Collections, Rare Books and Manuscripts. The collaborative three-year project, Bibliotheca Philadelphiensis, or BiblioPhilly for short, will digitize 475 European medieval and early modern manuscripts, and additional individual pages from the collections of 15 universities and other Philadelphia-area institutions. The high-resolution images and accompanying analyses will be made available to the public, free of charge, on Penn Libraries’ OPenn database. “By digitizing these manuscripts and putting them online, we are saying these manuscripts belong to everybody,” says curator Dot Porter, who is heading the project for the Penn Libraries’ Schoenberg Institute for Manuscript Studies. 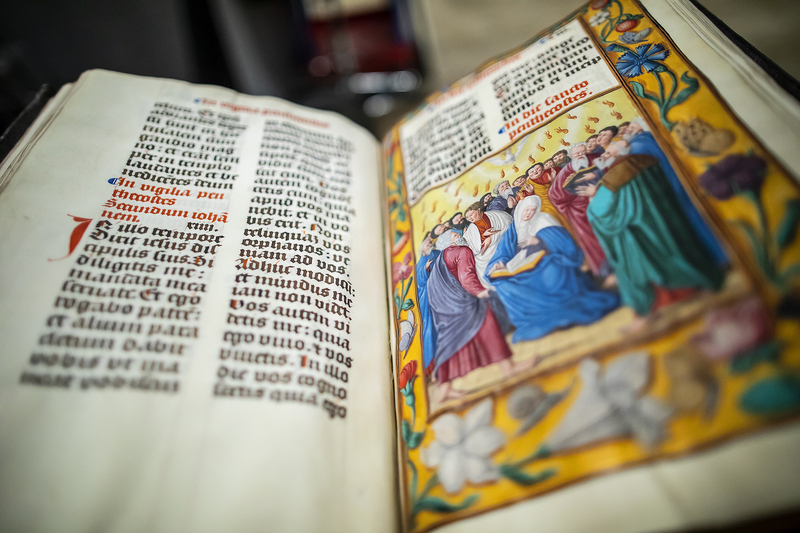 Penn has been an innovative leader in using the latest technology on centuries-old texts, and in granting open access to the digital images. Penn’s medieval and Renaissance manuscript collection is already digitized and available online, and is continually updated as new texts arrive. BiblioPhilly allows Penn to share its technology and expertise. One of Penn Libraries’ stated missions is to make rare manuscripts and materials more available to recognized scholars around the world, but also to everyone else. Unlike Penn, many institutions restrict access, often to academics who can prove research interests. “Suddenly, through digital technology, we have the ability to get to everybody. We can get to people in Timbuktu, and we can celebrate the extraordinary holdings we have and truly democratize our knowledge for all to enjoy,” says Noel, who is also director of the Schoenberg Institute. The project is funded by a $500,000 grant from the Hidden Collections Initiative of the Council on Library and Information Resources, which in turn is supported by the Andrew W. Mellon Foundation. A team of a dozen experts at Penn Libraries has been working on BiblioPhilly, in the Kislak Center for Special Collections, Rare Books and Manuscripts, and the Schoenberg Center for Electronic Text and Image (SCETI). Manuscripts are received at SCETI, then locked up in a secure location until going through the digitization process. The July shipment, including Lewis E 160, was the last from the Free Library, which contributed 250 manuscripts, most from the collection of John Frederick Lewis. The Free Library included the largest number of texts of the 15 institutions, all members of the Philadelphia Area Consortium of Special Collections Libraries (PACSCL), which applied for and received the grant for the project. All the texts in BiblioPhilly are from Europe, dated before 1600, the majority around 1400. Each is unique, every aspect created by hand—the ink, the writing, the painting, the stitching, the binding, even the parchment pages from animal skins. The manuscripts vary widely in size, from those so large they need stands, meant for use in front of great choirs, to palm-sized miniatures. Many, like the Free Library’s E 160, are religious texts, including several Book of Hours—prayer books known for their detailed illuminated illustrations. The first stop in the digitization process is an archival photographer. Starting with the cover and working through to the back, digital camera operator Andrea Nuñez takes photographs of each page, making sure everything is included and is in focus. “Some of the things we’re really trying to capture in these images are the extreme detail of the calligraphy, what’s written down, and also the fine details of the actual paintings within the illuminated manuscripts,” Nuñez says. Those revelations are what have impressed Lois Fischer Black, Lehigh’s curator of special collections and principal investigator on the project. “It’s not until it is digitized and photographed that we can zoom in, see brush strokes, or where the pen has left the page, or corrections, or where the scribe scraped the ink off to make a correction,” she says. One of the 28 items from Lehigh included is a vellum scroll, 20-plus-feet long and a foot wide, a genealogy of British kings from the monarchy’s earliest history through the early 16th century, Black says. Such unique objects can be challenging to manage, but the Penn team works to find solutions. For the scroll, Nuñez photographed it in sections. For the oversized volumes too large to move, she took her camera equipment on location. Nuñez says a manuscript she recently photographed was inscribed with the date 1050. “I thought to myself, ‘Wow, I am holding a book that is almost 1000 years old and it’s in beautiful condition,’” she says. Once checked and double-checked, the images and analyses are published to OPenn in a format that is easily downloadable. The data will eventually be searchable by keyword. All told, an estimated 160,000 pages will be digitized in the process of BiblioPhilly. But even though this project is nearing its end, Penn Libraries will continue its effort to digitize volumes from partner institutions through a similar grant-funded project for manuscripts from the Muslim world. The first manuscripts arrived from the Free Library in July. Not subject to copyright, being hundreds of years old, the public can do with the digital texts and images what they wish, Noel says. Scholars can access and expand their research, yes. But people can also download images and use them in myriad ways. Maybe we will see a painting from Lewis E 160 on a T-shirt someday? Louisa Shepard is News Officer at the University of Pennsylvania. Our thanks to Louisa and the University of Pennsylvania for this article.